The five-year Anatomical Pathology curriculum is offered over 65 four-week blocks. 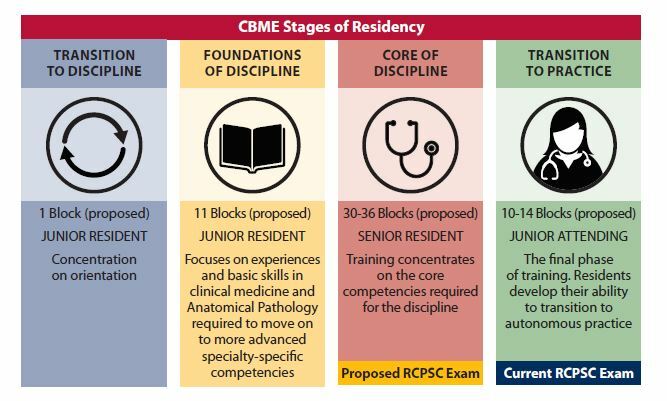 Embracing a competency-based philosophy, training is organized into four distinct stages: Transition to Discipline,Foundations of Discipline, Core of Discipline and Transition to Practice within which residents develop entrustable competence in specific professional activities. Surgical pathology training is organized into organ-based subspecialty rotations. This is a real strength as residents can focus on attaining mastery of the gross and microscopic pathology of one organ system at a time allowing for the rapid acquisition of competence in that area. Residents work directly with sub-specialist faculty members allowing for high-quality, daily face-to-face teaching. As residents progress though the program they are afforded progressively greater responsibility and by the completion of the program are ready to function as independent junior consultants. Residents have the opportunity to complete off-site elective rotations to pursue individual interests/learning goals and to explore fellowship/work possibilities. Also, for interested residents, research electives can be completed.